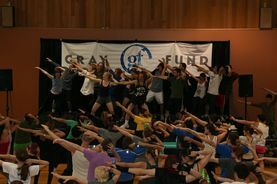 Fashion isn't the only 1980s cultural iconography recently spotted on the Reed campus: on Wednesday, Richard Simmons made a Gray Fund-sponsored appearance to motivate and inspire the Reed community during reading week. Simmons spent the first part of the day roaming around campus in his short-shorts and sequined top, dishing out hugs, kisses, and compliments to students, faculty, and staff. (Sadly, I hear that President Diver was out of the office when Richard dropped by.) By shortly before 3 p.m., Simmons was outside the sports center greeting people who were dresseed in their workout best and and ready to hit the gym for a straight-out-of-the-late-twentieth century aerobics routine. Witty and self-effacing, Simmons worked the crowd a bit before heading up on stage to get the aerobicizing started. Simmons's love of people, life, and exercise shone through everything he said and did; he was euphoric in the presence of hundreds of participants and buoyed by the tunes blaring out of the sound system. He ribbed the folks who chose to watch rather than dance, worked in a centennial joke, and scoffed at those who couldn't touch their toes during the stretching exercises. 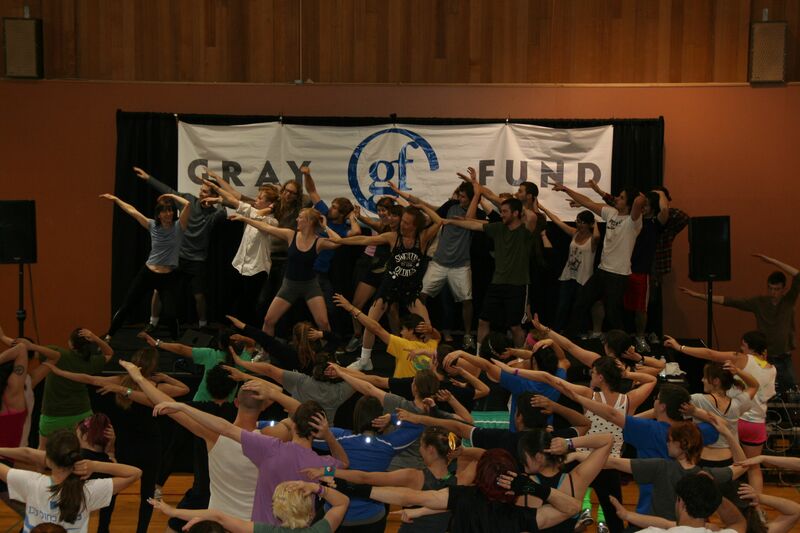 Participants waved their arms, grapevined, kicked, and strutted. Simmons invited a wide-ranging selection of people up on stage to dance with him, encouraging men to doff their shirts and everyone to be proud of their participation. So strong was the positive vibe in the room that I don't think it was possible to walk through the door without cracking a smile and breaking out the jazz hands.